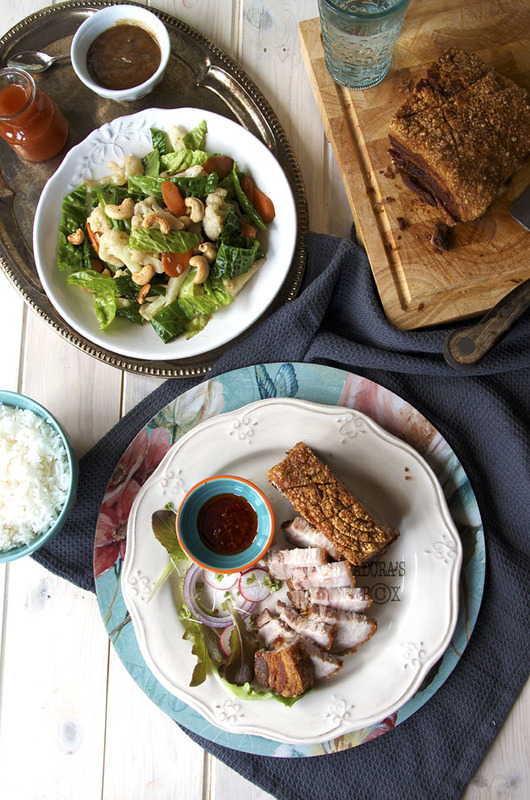 The love of pork lies deep in a Filipino's heart. Words like lechon (roast pig or pork joint) and pritong baboy (fried pork) would tug at heartstrings. 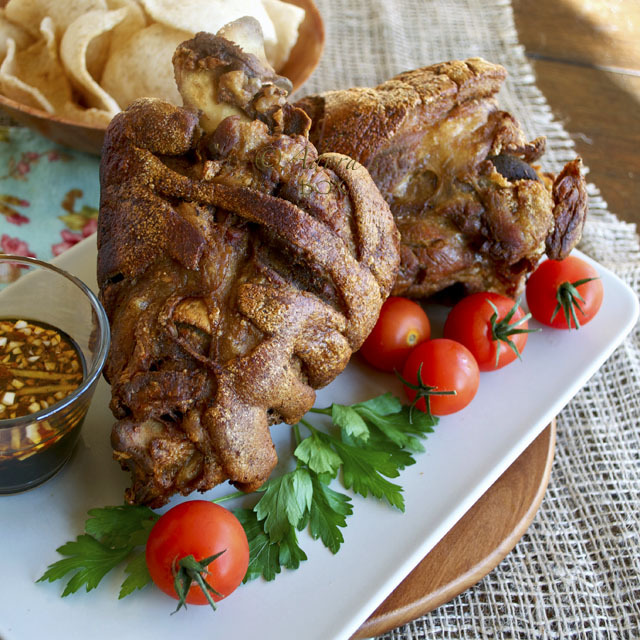 Lechon kawali would bring a double dose of happiness as it is basically a deep fried version of lechon. 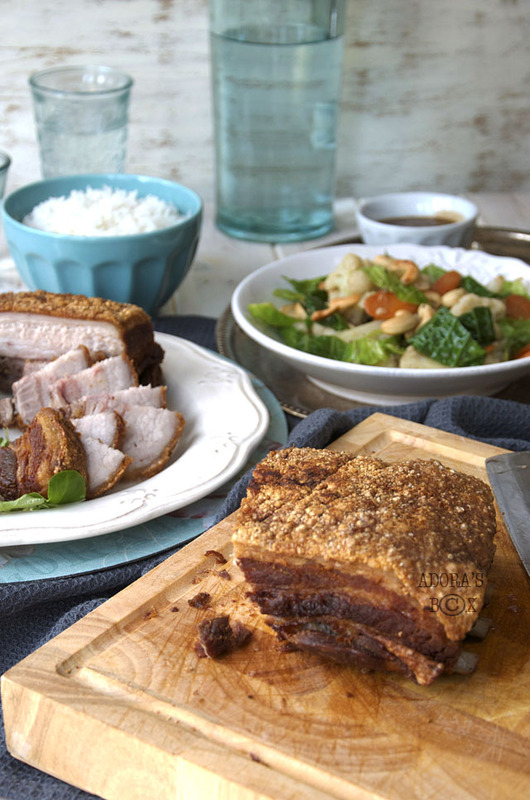 Lechon, although a Filipino favourite has its roots from the Chinese cuisine. 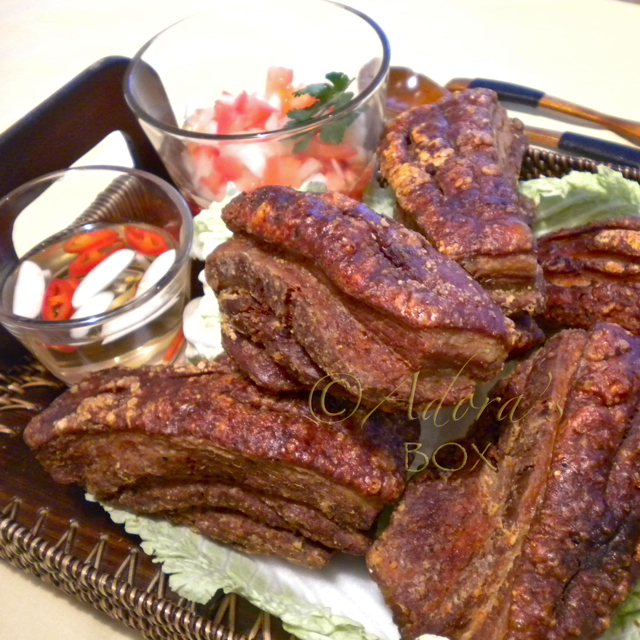 I usually roast my belly joint but in the Philippines, it is usually made in a pan (kawali). 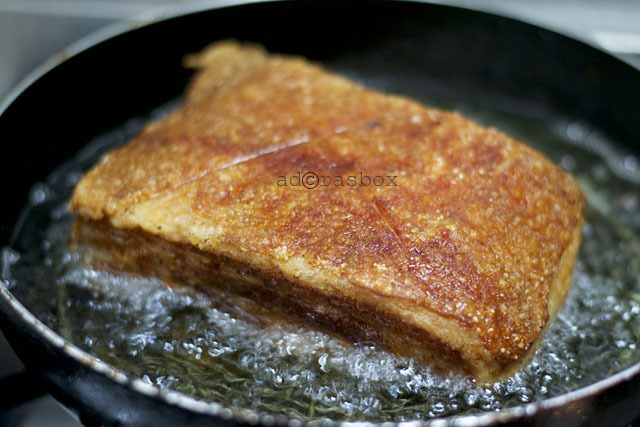 Lechon kawali is a joint of belly pork, parboiled until tender then deep fried resulting to a meltingly tender meat and crisp skin. 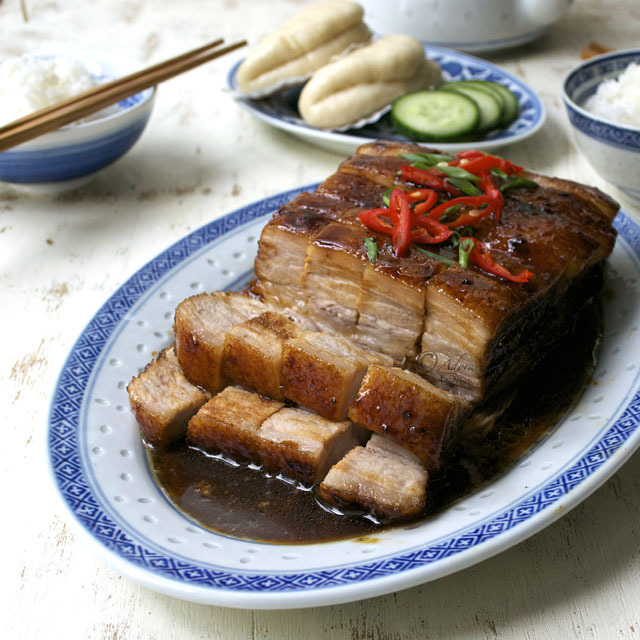 While roast pork renders fat, lechong kawali retains all the fat, with only the skin and the outer surface of the meat bearing the crunch. 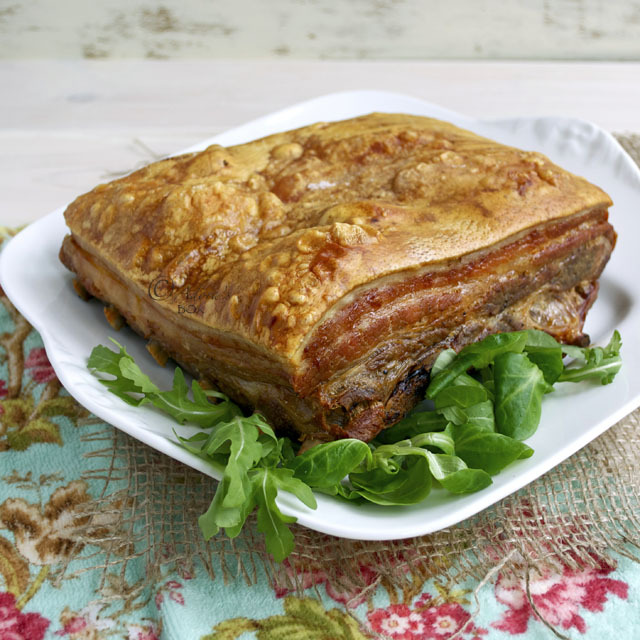 It is an easy alternative to roast pork yet is equally as delicious. Fried food aficionados would prefer it to roast pork. 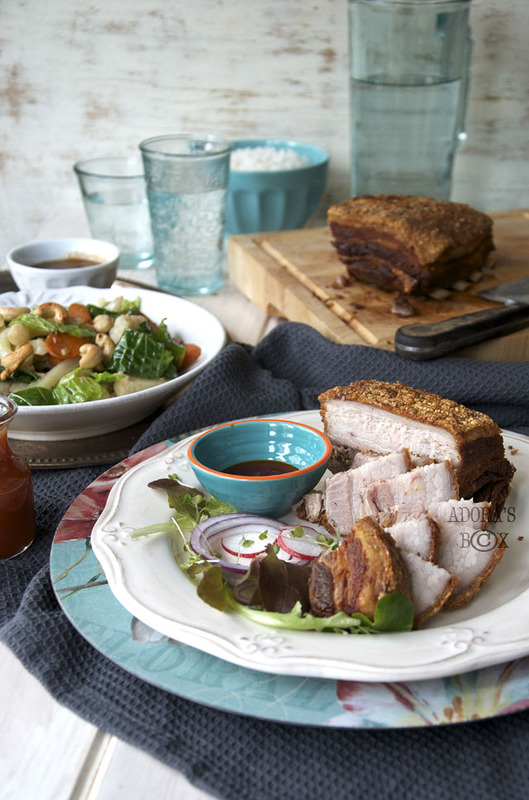 The sauce can either be lechon sauce, sweet and sour sauce or a spiced vinegar dip. Whichever one it is, the lechon carries it well. Needless to say, it is served with freshly steamed rice. Put in a pot or pressure cooker together with the rest of the ingredients (except the cooking oil) and top up with water to cover. 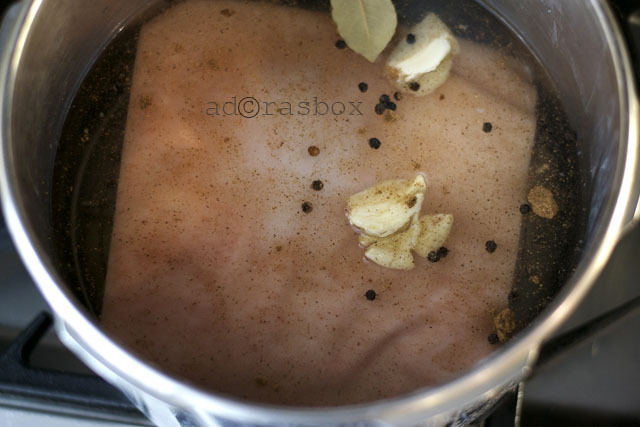 Boil until tender, 1 1/2-2 hours in an ordinary pot or 30 minutes in a pressure cooker. When done, transfer to a cooling rack and scrape clean. Prick the whole are of skin with a fork. Wipe off excess moisture. Sprinkle the pork skin with extra fine salt. Leave to cool completely, then refrigerate. This may be done a day in advance. 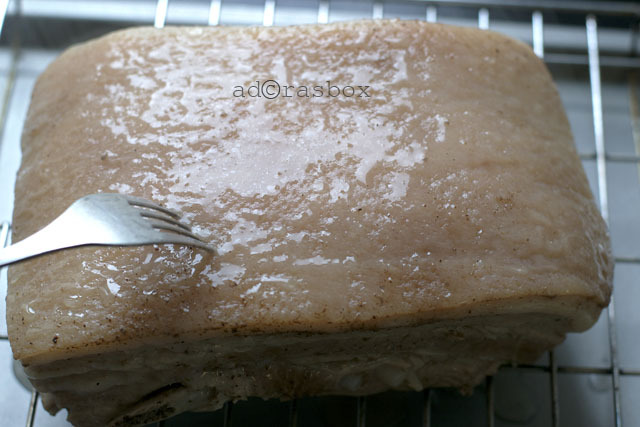 The pork joint should be very cold and the skin dry before frying. Heat up a good amount of oil in a wok or pot. Put metal trivet at the bottom of the pan so the skin won't stick and to surround the whole joint with the hot oil. Have a domed lid and a heavy bowl ready. 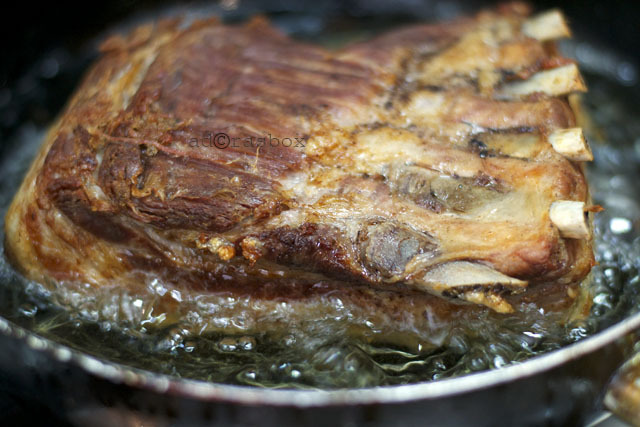 When the oil is very hot, carefully slide the pork joint in the oil, skin side down. Cover with the lid and weigh down with the inverted bowl. Fry in low heat for ten minutes until the pork is medium brown. Turn the pork joint over and fry the other side. Transfer to a cooling rack. Cool completely. The pork joint may be frozen at this stage for future use. To finish cooking, heat up the oil until very hot. Drop the pork joint, skin side down into the hot oil. Cover with the lid. Fry until crisp on medium high heat for about 10 minutes until the skin is all blistered and crisp. Chop into bite sized pieces before serving with lechon sauce, sweet and sour sauce or vinegar dip. 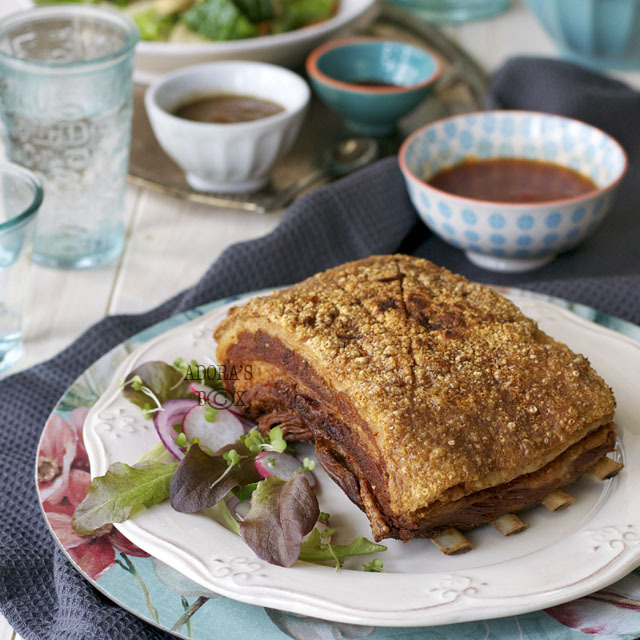 Beautifully styled and explained recipe; looks delish! When you say "cooking oil, what cooking oil do you recommend? I mostly use sunflower oil for cooking so that's what I used here. Vegetable oil or groundnut oil are both suitable all around cooking oils. You really did a great work. I appreciate your time to do all these. Keep sharing these types of recipes, it will be very helpful for the foodies and also the home makers. Thanks for sharing.